Bilbee Picks up Second Win of 2018! Indianapolis, Indiana driver Nick Bilbee won for the second time in 2018, and his third in his career. Landon Simon lead the first 5 laps of the 26 lap feature before Bilbee was able to make the pass on Simon. Bilbee built up about a second and a half lead over the rest of the field after Dickie Gaines assumed the second spot after getting around Simon for second. A late race caution bunched the field up once last time for Gaines, Simon and others to mount one last challenge to Bilbee but it wasn’t enough. Bilbee won by just over 2 seconds over Gaines, Simon, Garrett Abrams and Brent Beauchamp. Bilbee and Abrams were heat race winners. 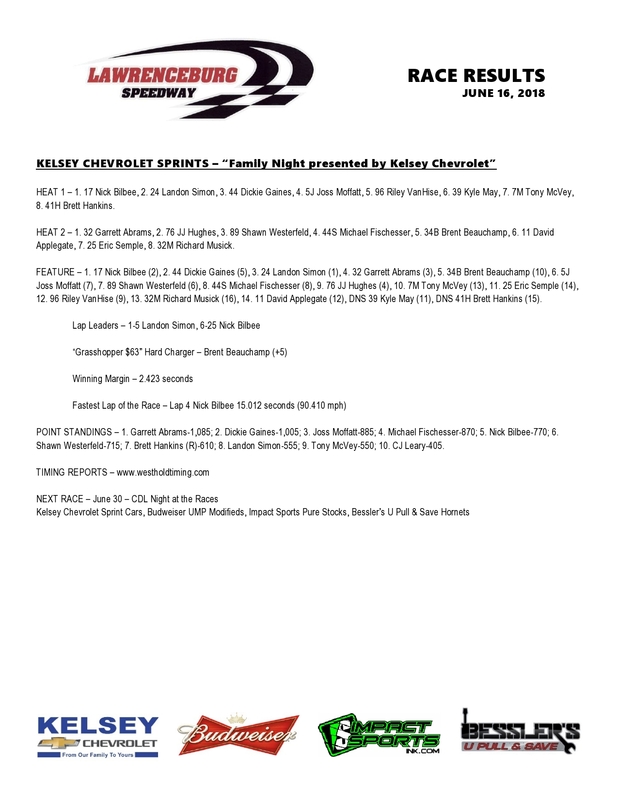 The Kelsey Chevrolet Sprint Cars return to the track on Saturday June 30th. Stricker Wins second in a row! 3rd generation driver, Adam Stricker picked up his second win in a row at Lawrenceburg and the team’s third win in a row after Nick Hoffman won in the same car to start this 3 race win streak. Stricker would take the green flag from the 4th position and would quickly work his way to challenge the early race leader and current point leader Brad Weick. Add Matt Hamilton to the mix and it was a 3 car battle for the top spot. The leaders traded slide jobs back and forth only to be delayed by a few caution flags. Stricker took over the top spot on lap 8 and started to flex his muscle as the car to beat. Hamilton needed a couple laps to get around Weick for second and may have been catching race leader Adam Stricker at the end but ran out of laps and settled for second. The rest of the top 5 was Brad Weick, David Spille, and Scotty Kincaid. Heat race winners were Stricker, Weick, and Hamilton. 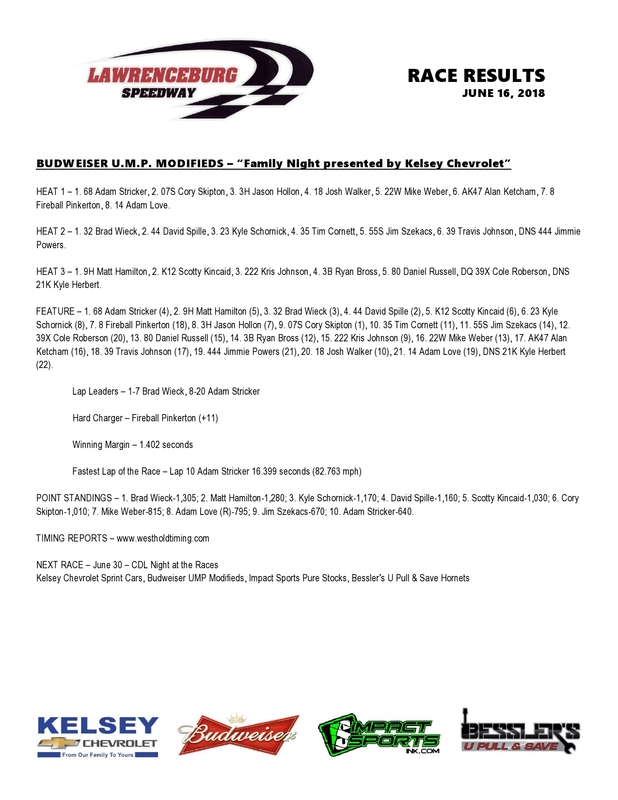 The Budweiser UMP Modifieds return to Lawrenceburg on Saturday, June 30th. Matt Morris Wins Hornet Feature! Louisville, Kentucky native, Matthew Morris doesn’t race but a few times a year. He races even fewer times at Lawrenceburg. But when he races at Lawrenceburg, he is really good. Saturday night he showed just that as he won for the 3 time in his career in only a handful of starts. He led from the drop of the green flag and led the first 11 laps. Defending track champ, Cordell Moore had moved his way to second and on the white flag lap, got into Morris, forcing Morris to slide high and Moore beat him back to the checkered flag. However, Moore was penalized for not restarting single file on the last restart. That penalty was accessed after the checkered flag moving him back to 3rd place. This vaulted Morris into victory lane moved Rob Sharpe to a second-place finish followed by Moore, Madison Kearns and Bradley Eberhart. Heat race winners were Moore, Miller, and McCoy. Gary Hume won the B Main. The Bessler’s U Pull N Save Hornets return to the track on Saturday June 30th. Mike Ackman Wins First Career Purestock Feature! Mike Ackman picked up his first career Purestock Feature win on Saturday night in what turned out to be the largest field of Impact Sports Purestocks in 2018. 17 cars were set to compete with 16 taking the green flag for the feature. Jerry Helton led the first lap before Ackman took over the top spot and led the remaining 14 laps. Ackman was never challenged after assuming the lead on his way to his first career victory at Lawrenceburg. The rest of the top 5 was Steve King, Eric House, Don Grace, and Jerry Helton. Heat race winners were Christopher Combs, and Mike Ackman. 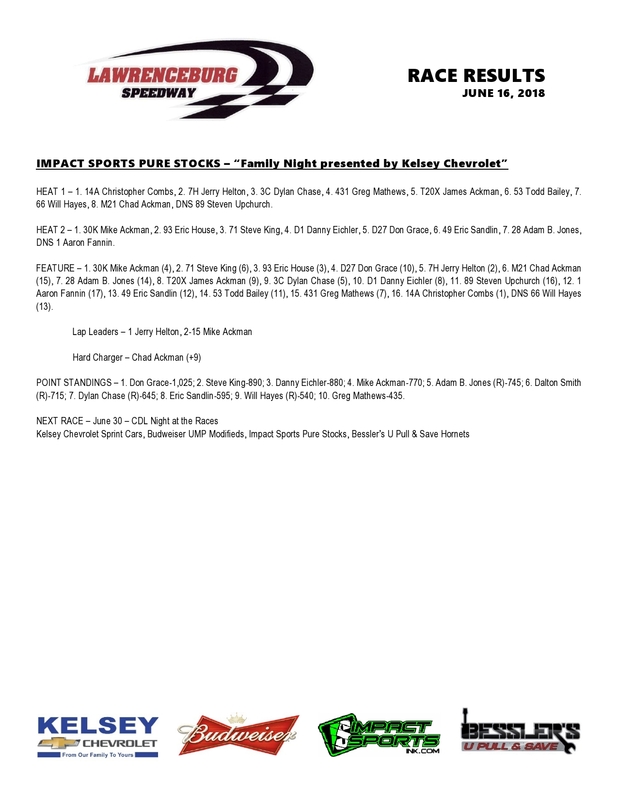 The Impact Sports Purestocks return to Lawrenceburg on Saturday June 30th.